Ryan Pitkin Protesters rally outside CMPD headquarters during a peaceful protest on Thursday, Sept. 22. On the evening of September 21, just over 24 hours after Keith Lamont Scott was killed by a CMPD officer in northeast Charlotte, Misty McCollie stood in the parking spot where he had parked his car for the last time. Standing near a shrine-like memorial built for Scott, where neighbors would come by and drop off flowers throughout the night, she spoke of how she had hoped more folks would come to the vigil there at The Village at College Downs, instead of the rally planned for Uptown that night. 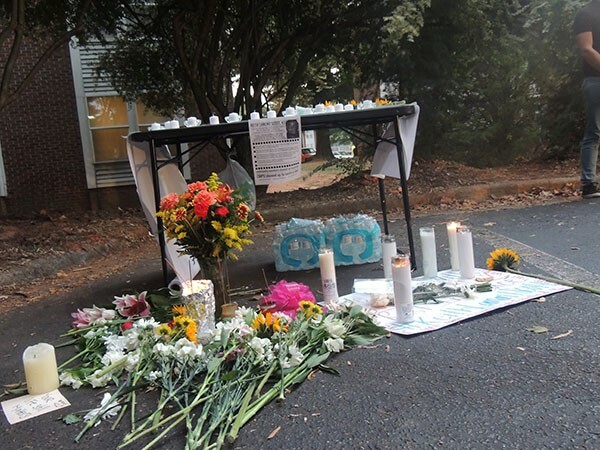 Save for a handful of Guilford College students from Greensboro and local organizers who had been canvassing the neighborhood to offer support to residents, the vigil mostly consisted of neighbors. They mourned Scott while discussing solutions for community problems ranging from police violence to the everyday woes of child rearing. McCollie hoped nothing bad would come of the Uptown rally following violence between police and protesters outside of her own neighborhood on the previous night, but she wasn't optimistic. "We could do whatever, it doesn't matter," McCollie said. "We could go downtown and tear stuff up and do whatever but at the end of the day, another black man is probably getting shot by a police officer right now." About 30 minutes after she said this, news came flashing across the cellphones of those gathered at The Village that a young man had been shot during protests Uptown. First reports indicated he was dead. Later, the city would report that the shooting that took the life of Justin Carr was believed to be an act of violence between two protesters, and Rayquan Borum would later confess to the crime, according to the prosecutor. But on the ground, fellow protesters were convinced the police had fired the fatal shot. Many eyewitnesses standing near Carr at the time of the incident are still wholly convinced of this. 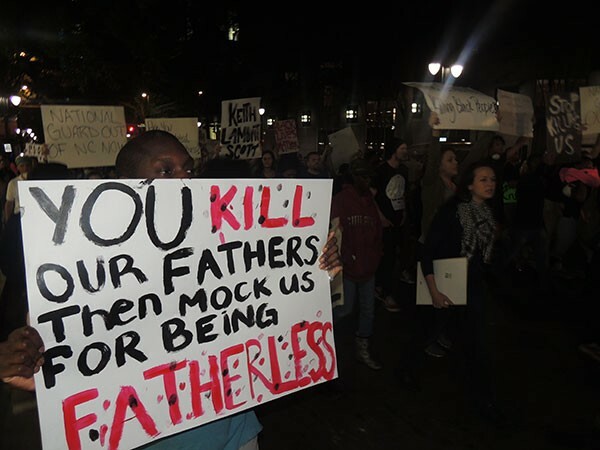 Word spread among protesters that police had killed one of their own, and the incident fueled a rage awakened by Scott's killing; one that hadn't subsided since the shooting death of Jonathan Ferrell by then-CMPD officer Randall Kerrick three years earlier — nearly to the day — and the mistrial that followed in that case. Wednesday night would end with at least hundreds of thousands — if not millions — of dollars in damage to local businesses, the declaration of a state of emergency in Charlotte and a new understanding for what was at stake in the oft-ignored struggle of Charlotte's black working class and the movement for black lives. Following the unrest in Charlotte that Wednesday night, peaceful marches continued through the streets of Uptown on a nightly basis. There were handfuls of arrests here and there, many of which for minor infractions like blocking traffic, but all in all peace prevailed. 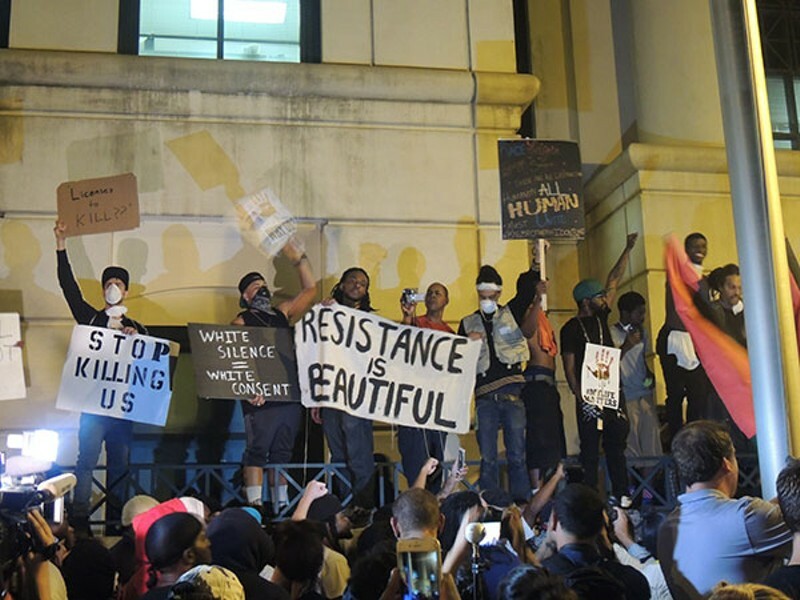 In the days following the unrest, local organizers formed Charlotte Uprising, a coalition of organizations like Tribe and the Trans and Queer People of Color Collective. Charlotte Uprising organized many of the marches, during which protesters often gathered for rallies at Marshall or Romare Bearden parks before taking to the streets, shutting down traffic as they chanted and stopped for speeches. The crowds grew as the week went on, with as many as 800 people marching throughout the day on Saturday, pausing at Marshall Park for pizza and to listen to CMPD Chief Kerr Putney's press conference before resuming their march through the night. Putney's partial release of body- and dash-cam footage of the Scott shooting that day did not appease the demands of protestors, who called for the full release of all footage. 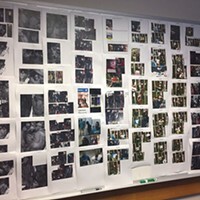 Many believed the videos had been not only edited for length but doctored, as no sound can be heard on the body cam footage for the first 20 seconds of footage. Bree Newsome addresses the media during a Charlotte Uprising press conference on Monday, Sept. 26. At a press conference on Monday morning, Charlotte Uprising members discussed a list of demands they had created for the city of Charlotte and the Charlotte-Mecklenburg Police Department. 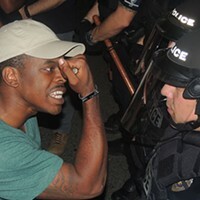 The list included putting an end to Charlotte's state of emergency status, the removal of the National Guard from the city, the release of all those arrested in the unrest following Scott's shooting and the release of the full body- and dash-cam footage linked to the Scott case. Two of Charlotte Uprising's demands — the release of all remaining footage involving the Scott shooting and a call for the U.S. Department of Justice to conduct an investigation of the CMPD — correspond with similar demands presented by the NAACP North Carolina State Conference at a Charlotte City Council meeting on Monday night. A new demand added to Charlotte Uprising's list on Monday morning, although it wasn't included in the original 10 demands, was for the immediate resignation of Putney and Mayor Jennifer Roberts. 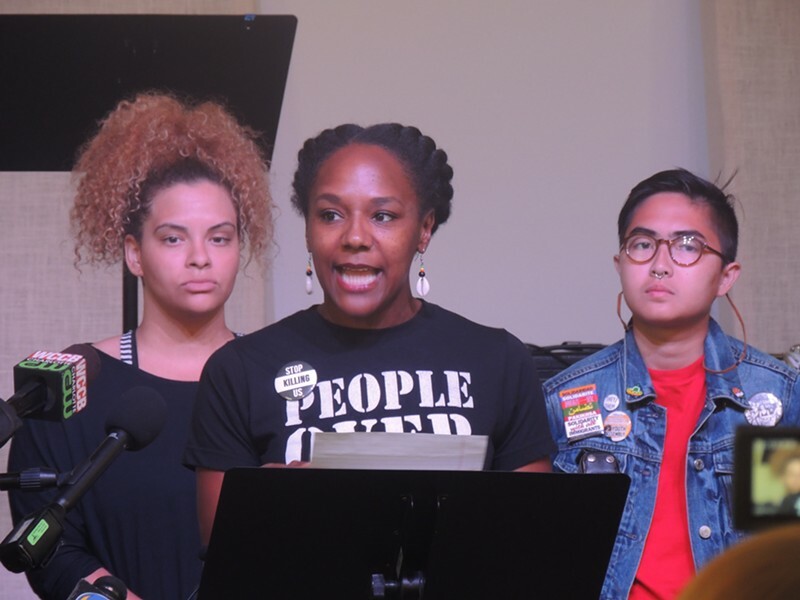 "As community organizers and leaders, we have engaged with Chief Putney in the past and he has promised us that CMPD would be more transparent under his leadership," Bree Newsome with Charlotte Uprising said on Monday. "We feel that these promises have been broken and we therefore call for the immediate resignation of Kerr Putney as Chief of CMPD. We have no confidence in his ability to either serve or protect our communities." At a press conference on the Thursday following the state of emergency declaration, Putney was asked how he could square his promise of full transparency with his refusal to release the tapes. His answer has since become infamous in the eyes of protesters and even people watching from afar, as its been skewered on social media. "I never said full transparency," Putney responded. "I said transparency, and transparency is in the eye of the beholder." 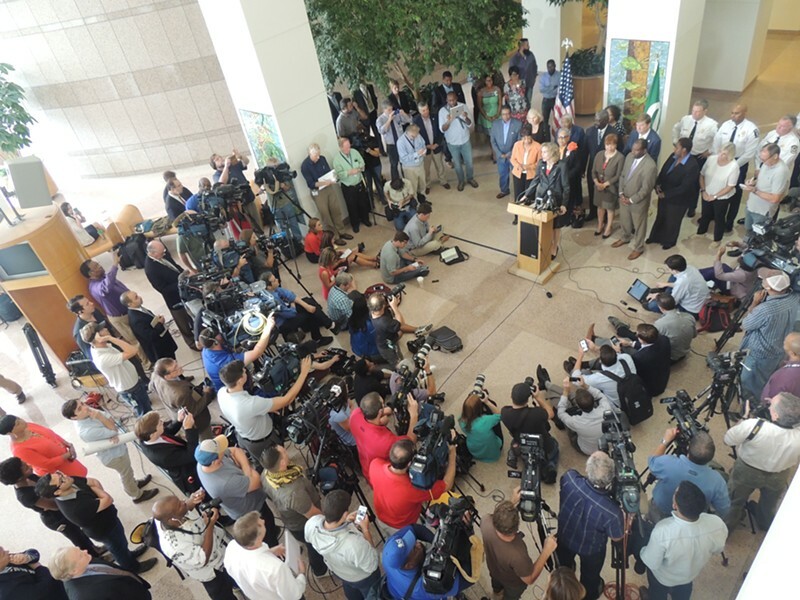 Jennifer Roberts addresses the media on Thursday, Sept. 22, following unrest in the city. Speakers lambasted Roberts and council members at Monday's council meeting, disrupting the meeting with chants and heckles. Roberts, who was known to state "Black Lives Matter" during nearly all of her debate appearances and campaign speeches while running for mayor, has been seen by many as complicit in Putney's evasiveness in dealing with the Scott killing. 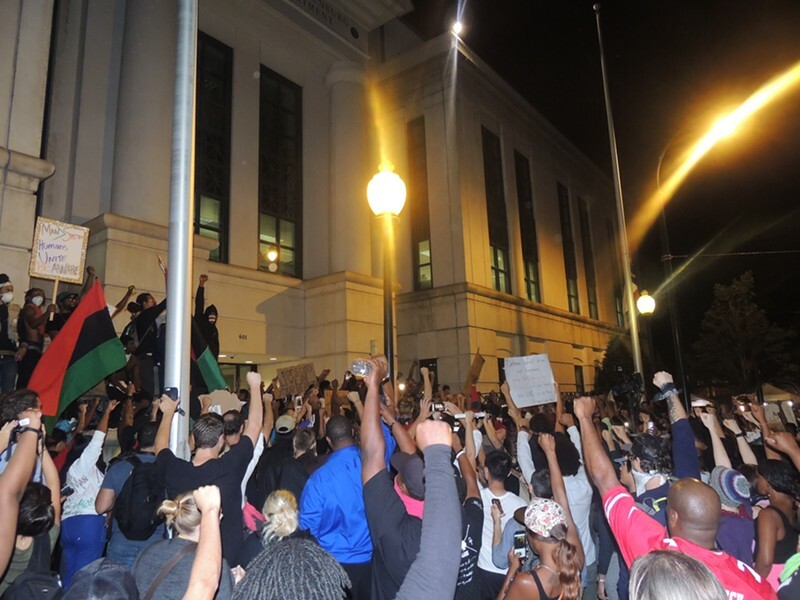 "We're asking them to resign from their positions, as they've been obstructing justice and they have not upheld their duties to the people," Ashley Williams of Charlotte Uprising said. "They have been inconsistent with their stories since Tuesday ... Because they refuse to follow the leadership of those they claim to represent, they should not govern here." The call for Putney's resignation underscores a theme that is more prevalent in the response to Scott's killing than was evident following the killing of Jonathan Ferrell in 2013: a distrust and often a complete write-off of any CMPD statement telling their version of events by protesters. The near-immediate arrest of Kerrick following Ferrell's shooting, perhaps buoyed by the Ferrell family's repeated references to police officers within their immediate family and calls for a peaceful push for policy change, may have led to a more restrained reaction than we've seen following the Scott shooting. Scott's family did release a statement on Wednesday calling for peaceful protests in the lead-up to the rally at Marshall Park, but a distrust in law enforcement and the justice system — bubbling under the surface since Kerrick's mistrial declaration — was amplified by contrary stories that arose following Scott's and Carr's killings. Statements from police in both shootings conflicted with those from witnesses on the ground, whose accounts spread through social media and cemented the belief of many that a cover up was at hand. 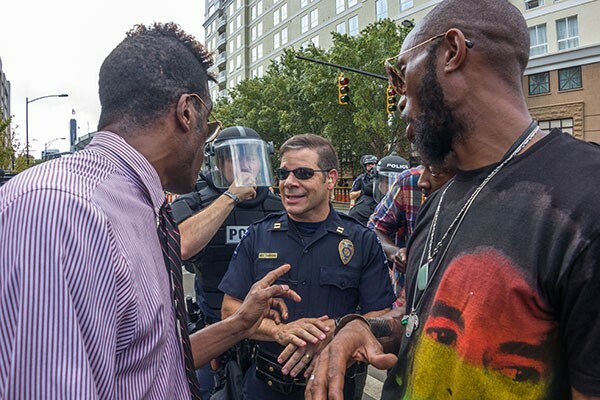 Captain Mike Campagna with CMPD, who walked alongside protesters during marches throughout the week following Scott's killing, downplayed the lack of trust between residents and police, attributing it to a loud majority. "I think that is a small but very vocal part of this group," Campagna said while walking alongside protesters on Saturday night. "I think that, overall, when you look at the city of Charlotte and our residents, I think we do a great job. I think we have a great relationship with the community. It's not perfect, by any means, and we can certainly do better, but I think we've made a lot of steps over the last decade of really trying to work on that." Capt. Mike Campagna engages with protesters outside of the Panthers game on Sunday, Sept. 25. During each march, Campagna could be seen engaging with protesters, having in-depth discussions. He said that, while some involved in the marches don't want anything to do with him, he tries to listen as best he can to those wanting to vent their frustrations so he can build relationships and work toward positive reinforcement. "To me, the critical thing is there's stereotypes and there's myths between both groups," Campagna said. "The world will tell me that a young black man is dangerous or a criminal or a thug or whatever, and the world will tell them that I'm trying to kill them, and they're both wrong. There are people that fit bad cop stereotypes, there are people that fit bad young black male stereotypes, but they're on the fringes, they're really the exception and not the rule." Campagna's goal is to build better relationships outside of times of crisis, so that when a crisis does happen — whether it's a small issue like a traffic stop or a larger issue like a police killing — the trust is there. "If the only times people are engaged with police officers is in those times of crisis, then all their experiences are going to be negative," Campagna said. "So we've got to get away from the 911 calls — away from those things — and find opportunities to engage each other personally rather than on a professional basis." For Newsome, however, the way police respond in these times of crisis makes all the difference. At Monday's press conference, she emphasized her belief that police should carry the burden for the events that transpired on Tuesday and Wednesday, due to the nature in which she says officers escalated things. "[A police killing] is a traumatic thing for a community to experience and ... it is especially traumatic when it happens in certain neighborhoods," she said. "So instead of the police showing up and dealing with the community and the trauma they are experiencing; giving them answers, showing the video right away, being transparent, engaging in that way, they show up with SWAT gear and war methods and tear gas, to a community of residents. There is absolutely no balance of power between the police — who are backed by the state government — and the residents." For those residents who came together at The Village at College Downs on Wednesday night, change will come not through protest but in a newfound motivation to become active on a political level. Quan Davis, another of Scott's neighbors, said she wants to form a grassroots political action group to represent the interests of those in her area who are either too busy or unwilling to attend bureaucratic meetings. Davis's plan is to get together a handful of people willing to research the voting records of local elected officials and the platforms of new candidates in local government — from state representatives down to the school system — to educate those in the neighborhood who are less politically adept. "We can be there to speak and be a mouthpiece for the community, because everyone is not articulate," Davis said. "Everyone cannot express themselves appropriately. They get overly passionate and it's seen as aggression or anger. It takes someone with an even keel that can just speak and get their point across and have an open dialogue with whomever, so they'll see, 'You know what, this community is not playing. They're serious.'" A memorial to Keith Lamont Scott in the parking lot where he was killed. N.C. Rep. Carla Cunningham, who represents the 106th District, which includes The Village at College Downs, was in the community Wednesday night. At the time Scott was shot, Cunningham was in west Charlotte attending a panel with the mothers of Eric Garner, Sandra Bland and Dontre Hamilton, all of whom died at the hands of police or while in police custody. When she heard the news, she called the mayor's office to find out if it happened in her district. "I've been expecting it," she said. Perhaps that's because, from where she stood at the site of Scott's shooting on Wednesday, she was just five miles from the site of Ferrell's shooting in 2013 and one mile from the spot where Daniel Harris was shot and killed by a state trooper in August. Cunningham knew residents of The Village would be traumatized, and got to work setting up a "safe space," where residents could vent their frustrations or seek free counseling. She heard from those who missed work Tuesday night because they were stuck inside the complex. She heard from a veteran who was triggered by her own past experiences to the point where helping her daughter cope with the situation was hard. She heard from a young man whose mother was calling repeatedly to make sure he was still OK.
"We focus on what's dramatized; what raises the ratings on TV. But this impact is going to last for the long term, and we have to start somewhere," Cunningham said. "It's not me going downtown." Speaking with Davis and McCollie on Wednesday night at The Village, the conversation turned to those who were protesting in Uptown. People were saying someone was shot and reports were that things were getting out of control, but there was no context for what was really going on in Uptown. While each agreed they would not be taking to the streets to protest, they also wouldn't hold judgment against those who took that route. "They're protesting over there because that's all they know to do, so they do what they can do," she said. "It's like a child, like my kids. When you're little, you don't have nothing but your little self. If your momma make you mad, you might tear your own toy up because that's all you have to do, and you can execute that power in that way, not thinking that you aren't going to have a toy to play with tomorrow. You are angry. You want people to know that you're angry so you exhibit that anger. It's a knee-jerk reaction and that's what's happening right now." McCollie shared the frustration of the protesters, at one point saying, "They see us like animals now, but if you're constantly treating us like animals, killing us or locking us up, how do you expect some of us are going to act?" She burned a sage stick and looked down upon the flickering candles and the ever-growing pile of flowers on Scott's memorial. "I expected [a riot]. It's normal now. The police and the government and everybody knows when they kill us that's what we're going to do. They know. It's history," McCollie said. "That's why I was not going down there either, because then y'all might have been coming to visit me maybe."